Antiques challenge. New expert Raj Bisram joins the road trip. This auctioneer from Kent is taking on Charles Hanson as they shop around Berkshire, Wiltshire and Somerset. and a goal to scour Britain for antiques. The aim? To make the biggest profit at auction, but it's no mean feat. 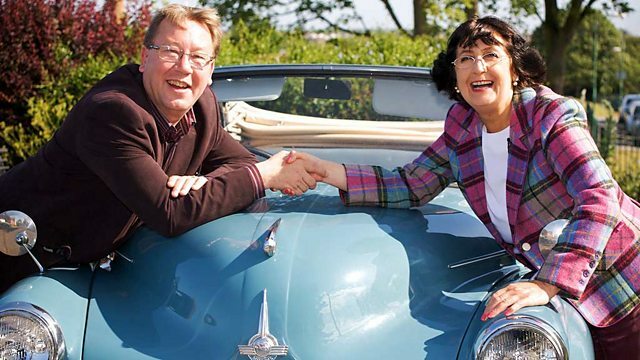 -This is the Antiques Roadtrip. Welcome to a brand-new trip in the company of a couple of auctioneers. Look at these staddle stones here. It's a shame they're not for sale. We could pick a few of those little stumps up. Steady on, fellows, we're still on the introductions. in the company of debutant Raj Bisram. -Do you prefer Raj or...? but he's been in the trade for over 30 years. He loves paintings, furniture and big deals. I look at you and I think, "Yeah, you are at the kingpin." You're a man who has that maturity. Before antiques, Raj was also a sportsman of some renown. I was a qualified ski instructor but I'd also raced as well around Europe. But then, the feeling is clearly mutual. Just buy what oozes your fancy, if that makes sense. OK. Yeah, yeah. No. Well, OK. I hope we're taking notes. -Do I have to comment about your driving? -Am I driving well today? -You're doing very, very well. But what's that burning smell? the millionaire Pink Floyd drummer, has a home nearby. -I will see you later. -Come back with treasure, OK? -OK, Raj, the division bell sounds. -Anne, lovely to meet you. and then if I find anything, we'll have a little haggle or something. It'll only be a little haggle though cos I'm quite a determined lady. Could be interesting, a rummage under Anne's stern gaze. That's quite a nice late 19th-century riding crop. a silver collar, but it's in pretty good condition, really. The ticket price is a cracking £8. Time to talk to Anne and granddaughter Amelie. Would you take a fiver? -Um...yes. I'm sure we would. -My first deal. Thank you very much indeed. -Now you'll always remember me for that. blissfully unaware of his rival's rather modest start? on the end of his profits and leaving me in the lurch. of gorgeous Georgian architecture, not to mention the buns. and got a tummy ache from Bath buns. -Now, we've been here before, Charles. -Good to see you. How are you? -And I think you're Charles. you called me Romeo and I called Caroline Juliet. -It's good to be back. -We had fun and games up on the gallery. -Lordy, there's certainly plenty of props in here. but now it's as full of as many antiques as Caroline can squeeze in. Oh, do be careful, Charles. You'll cause a landslide. -Tell me where it came from, Caroline. I got it privately. I can't say anything more. -or the Lord and Lady...blah, blah, blah. But what we've got is a beautiful Persian scalloped silver tray. or fanciful birds in this very arabesque cast and chased landscape. How much is on it, Caroline? 110. Is there much room there for negotiation? -No. I love your style. You're in stripes like me. If I said, "Caroline, what's your very best price?" -Well, I'll do one of you. -I'll wave my arms around. -90, OK. It's almost half my spending gone already. Can I think about it and I'll come back to you shortly? what's his rival got up to? in the north of England, which gives it a little bit more mystery. That's a very unusual little thing. There's two there. Another one here, a much larger one. This one, I don't think is as old. and they might make a nice little lot of kitchenalia at the right price. They're already pretty reasonable, Raj. Anne, these two egg timers... What's the best price on both of them? Aah. Your maths is terrible, isn't it? -You seem to go upwards instead of downwards. -Yes, I wonder why that is. -OK. £8, we have a deal. I've got to stick out for eight. There's not a lot in them. No, there's not much sand in them, is there? You can't use them for anything. OK. We'll say £8. -Eight? Lovely. Thank you very much. Never mind the zeros, we haven't had double-figures here yet. Back in Bath, Charles has some glass in mind. -This is quite interesting, isn't it? -Have we got a price on it? Not overly old, is it? -I just quite like the form of this. It's just got the look of the Art Deco. -I tell you what, I'll do it for 25. -Thank you very much. OK.
-I'll give it some thought. Where does that leave the silver tray, I wonder? Charles has a decision to make. Your silver tray... OK? It's had some restoration here, hasn't it? You've got some solder wear there, can you see? Oh, isn't that chewing gum or something? Obviously you've got to make money on it as well. Well, just a teeny-weeny bit. I know, but you've got a big business here and I admire you. I've got two cats I have to feed. -Will you take £70 for it? I thought you were going to say something like that. -I think it's full of far-eastern promise. -I tell you what, 80. -Look, 75 and that's it. -I thought we were friends. 72. It'll make about 120 easy. -I'll take it. Thanks, Caroline. With his deal done, Charles gets his hat. -but not in quite the same price range. It's got a few dents in it though. It's a bit damaged. It all depends what it can be. -Can we have a little chat about this? -It's quite a nice little silver urn. What would they have used that for then, Raj? I'm not exactly sure, to be honest, what this was used for. I believe that you've got £15 on it, but it is a little dented. -Can I make you another amazing offer? -Yes, I'll let you have it. Thank you very much. Three little buys and I believe that comes to £18. -I've got to try a little bit more. -Yes, I'll do that for you. -You're very, very kind indeed. -Let's shake on it. Thanks again. Raj is clearly a man with a strategy. fashionable Clifton down to take the waters at the Hotwells spa below. -Good afternoon. May I come through? -Am I on the right platform? Great to see you. What an amazing place. to restore the long-disused railway to its 1893 pomp. -behind you, almost a plan of how it was back in the 1890s. So, the railway tunnel... You can see, here's the top station. -So that's where we are now? -That's where we are at the top. You can see that the heaviest car goes down, the lightest car goes up. was the brainchild of the publisher and entrepreneur George Newnes. -It's quite steep, isn't it? -the wooden front of how a tram would have looked. That's actually a full-size replica. That wall shouldn't be here. -They've built all these walls on top of the railway line. -to down where I'm going? -You're 500 feet as the crow flies, 230 feet vertically. -Yes. They're just so ambitious. never made quite enough money. and the pump rooms were turned first into a cinema, and then a ballroom. but just a few years later it was to enjoy a very different use. -Thank you. Where are we going? -Well, we're going down to the shelters. where they could shelter deep underground. So, now you can see where we got the turnstile from. We cut a hole in the wall. It took us ten hours. -and you can see the railway lines there. -It's just amazing, isn't it? spent night after night in this cold and dank place. Maggie's colleague Peter can vividly remember what life was like. -I can see the railway track still underneath the cemented steps. They're steps to sleep on, actually. These are the sleeping places, all these concrete slabs. would be coming into these places, sleeping here. when they were in here together? "Goodness me, what's happening above there? "Are we going to hear a bomb drop?" for the firefighters. We just thought it was a bit of excitement. they could still carry on broadcasting. and then they went back again. studios, carrying on until the 1960s. for anything, but it had another life just during those few years. now anybody would have the guts to fill it in after what we've done. -It has such history and long may that continue. just outside the village of Langley Burrell at Fairfax Antiques. with almost 10,000 items for sale. There is a price tag for those for about 220 each. A mixture of antiques and reproduction. -They're foam. These have aged well, haven't they? -They must have been out there a long time because they almost look like the real thing. They are the real thing, those two. -These two are the real thing? Tricky business. Be on your guard, Raj. But if there's a bargain here, I'm sure you'll find it. during the Second World War, this one. but you don't often see the water bottles for some reason. -It's quite different. That's on my list of come-back-tos. Not a bad spot, Raj. Now, what else has Elizabeth got? These are quite nice wall lights, the brass ones. Those are very pretty but they're very expensive. Very saleable but... Gee whiz. They're priced at £95 each. -I think it's for the pair, actually. -Oh, is it? Is it for the pair? I might be inclined to make a little bit of an offer on those. OK, time to talk to the proprietor, Harriet Fairfax. -Hello, Lady Fairfax. I'm Raj. How are you? Well, I've had a lovely look round. -which brings me onto these. These are nice and decorative. but really I've got to make a profit and they're going into auction. I'd be happy paying 25 for them. -Yes. I'm going to splash out. £30. So well that he's decided to have a go at his other little find. I mean, it's in really nice condition and £35 on it. If I can get this for 15 or under, I'll be happy. -Yeah, well, to be honest, I was drawn to it. -but I'll give you £10 for it. I think that's all right. -Yeah, I think that's OK.
-Brilliant. Will we shake hands on that? Great. So, now he just has to make it past the livestock. Mind it doesn't spit. Nighty-night. Time for Raj to take a turn with the Triumph. I need to go on a driving course. I wish I could find the gears. All you do... Go into third now, so go up. Yeah, but foot on the clutch first. -Yeah, it was, it was, it was. -That's it, lad. You'll get this. -Can I make you an amazing offer? approach, splashing out £72 on just one item. Which leaves him almost £130 to spend today. -In English it means king. -In English Raj means king? but our next stop is in Hungerford. Hungerford, in a quiet sort of way, is something of a transport hub. A good spot for antiques, too. -Good to see you. What a gorgeous part of the world. -And you know what, I'm hungry for antiques. so time to pig out, Charles. -A lovely Victorian boar's head. Isn't he wonderful? -Ah, YOU look more like it. -I love the little sheep. That's cute. A little antique porcelain figure of a ewe, priced £95. for making these whimsical objects. for ladies of an important house to enjoy. The dealer's put, "Possibly Rockingham." Ah-ha. How much? -It's got a couple of chipped ears. He's a small little sheep. He's a bit tired. Do you want to do £50? -Well, let's see if I can squeeze £50 out of him. -I might hold him for a second. Is that OK? -Or even go for a stroll. What's he seen then? to question a label, and I'm a Derby man. I'm a Derby ram and this is my Derby ewe. How are you, girl? So, in fact, she was made in Derby not Rockingham. coming to auction. I'll find Alex. What's the best price on her? Have you called the dealer? -50 offered. 60 is the bottom. OK? but he's still got the appetite for more. and it's got stains on, you've got scars. why not serve it on something that's had experience? so I think that we can do a pretty good deal on this. I like your retail style but what's your wholesale hardness? OK, add the extra penny on. "My tray was made 15 years before the Battle of Waterloo." That's history. Thanks a lot. -That means I owe you 70 for the ewe and the tray. "Hanson, you've bought some firewood." and a nice bit of Georgian firmly in hand, Charles seems happy enough. the man who put the village on the World Heritage map? but the Scottish millionaire behind it was no less fascinating. and a good deal of wine, women and song. He was a very sociable person, I think. -Sounds like a good night out. that were published as Wessex from the Air. to save it from development and then turned his attention to Avebury. So, when Keiller arrived, what was here? Not many of the original 200 stones were visible at all. In fact, there were only 15 standing. -and building houses and walls. three huge circles that surround the village. He also built a museum. much-needed employment in the area but also provoked some controversy. He went to great lengths, didn't he, to clear some of the site? because they were actually on the line of the stone circle. what the true purpose of Avebury or nearby Stonehenge really was. However, one particular stone does have a story to tell. a skeleton of a man between the stone and the side of the pit. and three coins, and the coins allowed it to be dated to the 1320s. people who shaved, cut hair but also did little medical things, too. in the North Sea, and I think he rather liked that connection. and, a few years later, he sold his land to the National Trust. Avebury became a World Heritage Site in 1986.
and Tunbridge Wells in getting that rare prefix in 2011. -You must be Ed, as in the front door. despite his now limited funds, is certainly enjoying a close look. -I love your little chair over here. -Just tell me. We call it an Orkney chair why? -They were made in Orkney. -Isn't that a gorgeous chair? -The best price would be...? I would probably say 190. Oh, I wish I hadn't spent all my money earlier on. Oh, no. don't even think about this hallstand. OK, Raj, watch me. I can play big, as well. -I think I've got a stool for you. Yeah. Again, it's most likely Liberty & Co.
-The coffee stool is what they were sold as originally. -So, this is a Liberty retail stool? -these were possibly made in Tunbridge Wells. Yeah, when the Tunbridge Ware market declined. -..because there's no bits to go with it now. -I like this but it is tired. peel the tops off and have a cute little stool with that. Yeah. I think it's quite attractive. How much is it? -You can't say no to that. -is put the two together and see what price we come out at. Now we're getting somewhere. What's he spotted down there? inlaid in rosewood and ebony, and this I presume is a clothes brush? made in Tunbridge Ware. How much could that be? -£15, yeah. Do you now to use a clothes brush, Ed? -..and this small clothes brush. could you give me any discount on the two together? -What could you do for me? -How about if I said to you 30? Yeah, I'd be silly to say no. Thanks a lot. I'm delighted. That's great. It's not bad, Charles. Now, whither Raj? -SHOP DOORBELL RINGS Hi, I'm Raj. -Nice to meet you, John. -What a lovely shop you've got here. but this time, he surely means it. There's got to be a bargain or two tucked away in here. You've got a nice big collection of apothecary jars. I cleared a chemist shop that had been stored up since about the 1950s. These are quite collectable as well, some of these. They are. They're almost a museum in one piece. -There's a few headache cures in there. -Yeah, I bet, I bet. That's a no to the jars then. What is his game? He's a tough cookie, so I've decided to tread softly at the moment. I wonder if he's got any silver downstairs. Ah, well, in that case. Yes, that one. It's a little bit on the heavy side. What could be the best on it? 30 quid. You're right, it's a little bit dinked. What other silver have you got? That's a nice little silver sugar shaker, isn't it? maybe only just. I would say this is probably turn-of-the-century. What would be the best on this? Well, as it just got here, I could probably flip that for 160.
so I need a little bit of help along the way. -I'll give you a little bit of beginner's luck. I'll do that for 135 and that's the death on it. He's got the cash, but he's sticking to his cautious tactics. -Can you do a bit better on that for me? Shall we say 24 and we've got a deal? -Thank you very much indeed. Lovely. A final canny buy for our Raj. Now, let's remind ourselves what they both acquired. a riding crop and some silver. So, what did they make of all that lot? and, to be honest, it's a nice parcel. but he's bought some very small lots. fingers crossed it should be OK.
in our first road trip is very much £5 that, £10 that. Charles has bought well, but watch out for the newbie. # Heigh-ho, heigh-ho, it's off to auction we go. -Well, I can do Heigh-ho. on six long-distance footpaths, including the 102-mile Cotswold Way. -We've built our foundations on this, OK? Welcome to British Bespoke Auctions, home of the famous Bella. I wonder what auctioneer Nicholas Granger makes of our lot's lots. There's a couple that are a bit dodgy, if I can say that word. The little table, the Liberty-style table needs a lot of work to it. which are quite nice but damaged again. They're worth something but how much will they do on the day? We'll see later. My favourite is definitely the 18th-century Persian silver dish. I think that is spectacular. I think that's going to do well. -That would be my tip for the day. -So, who will win the first round? Roadtrip regular or our brand-new boy? Just have a quick look round at the people in here. They're smiling away. Hello, madam. She's here. We'll be OK.
We're starting off with Raj's sconces. I'm going to start off here with a commission bid. -With me at £35 on the book. and 50, 55. £55 we have. -Do we get £60? Have we got 60 in the room? Raj is jumping up and down. We've got 50 here. We need £60. I'm going to give fair warning with the sconces at £55. Are we sure? -The first of many, I'm sure. What a start. You've almost doubled up. Now for Charles's bargain Tunbridge Ware brush. cos I'm going to put my hands up, OK? Brush yourselves down with this one. With the bidding at £30. -Commission bid. Looking for 32 now. -We're looking for a 32. -32, 35, and £38 here. £38 we've got now. It's got to be worth 40, surely? -Charlie, it's got to be worth 40. -We've got 38 here then. We're going to sell it at £38 then. -Going once and the hammer goes down. Sold. Thank you. More profits. We started well. -So now I'm playing catch up. Well, reach for your whip then, Raj. Another cracking buy. -at £28. At 28, now looking for 30. 42 with you. £42. We have £42 in the room now on my left at 42. -With you in the room at £42. And 45 sitting down, sir, on my right. At 45 and 8? At 48 here. Looking for 50. Do I have 50 on the net? I've got 48 in the room then. I'm going to crack the whip at £48 then. -Yeah, I'm pleased with that. Advantage Raj. Will Charles's George III tray carry all before it? Who'll start me on this at £20? £20 we're looking for. -It needs a little bit of repair but it's a nice tray. -Thanks, mate! How are you? -At £20. Looking for 22 elsewhere. Have I got 22 in the room or at home? -It's a George III tray, ladies and gentlemen. and 25, you're going to go. Now I'm looking for 28. Thank you, sir, you're a good man. You're a good man. Thanks a lot. I'm going to try that on my next thing, OK? So, could I have some support? Worth a try, Raj. Maybe on your egg timers. Start the bidding on those, shall we? At £20, we're looking for. Looking for £20 in the room. OK, 15 I'll take. ..at £18 in the room. Now I'm looking for 20. -Brilliant. That's massive profit. Well done. I'm not finished yet, I'm not finished yet. At 25 sitting down here. Looking for 28 elsewhere. 28 on the net now. 28 and 30, sir? -W-w-wait, I'm hoping that it's not over. -..to the room. Thank you. He kept quiet, but they still picked up a profit. Can Charles's Liberty table match it? -I could be in trouble. Here we go. Don't look round. Cut that out. -A low cheeky bid at £15. -You've done it, you've done it. Would you like to go, sir? 28, would you like to go? -..at 28 on my right. At 28 bid. -Hello, the world. You're out. Going once, twice at £28 to the gentleman in the room. Someone's got a bargain. Now for Raj's little silver collection. -It's a good lot. Will it make £100? -You're just winding me up now. -Who's going to start the bidding at £15? -At 15, we've got here straight away. We've got £15 on this for Raj. Have we got 18 elsewhere? At 18. -We've got £15 only, in the room or at home. I'll sell at 15 then. A bargain. And 18 on the net now. -No, no. Shh! Be quiet, you. At £18 to the net... Sold. Thank you. -I hear the big bleat, don't I? Quite. Charles's favourite ewe. Was she a bit of a gabble? I'm praying. This could flop. I'm looking for £30 in the room or at home. It is Derby. -You've got a commission at 15. -I'm in trouble. I'm in trouble. Looking for £18 in the room or on the net. At £15 a commission bid. At 18 sitting down in the room. At 18 now. At 18. Looking for a 20. -Thank you, 20 in the room now. -Now at £20 and 2? Would you like to go, sir? At 22. And 5? Are you sure? -Oh, I don't believe it. -At £22 in the room then. Going once, twice at £22 on the sheep. No words necessary. Charles has made a big loss. But can Raj take advantage with yet another bargain buy? Starting the bidding at £15. We have on that at 15. Looking for 18 elsewhere. At 15 now. I'm looking for £18. It must be worth more. At 18 in the room, sir, thank you very much. At £18 with you. Looking for 20 now. -..hammer down. Charles says, "Hammer down." -That'll do. Thank you, that's OK.
-That's good. Happy? Look at me. Charles's biggest buy. The auctioneer's tip, too. -Don't worry, Charles. It's going to be all right, OK? Commission bids on this, ladies and gentlemen. At £120 starting. -Get in. We're in business. -Let the net run now. 180 now. Looking for 190. 190 now on the net, 190. -At 200 and 220 now. -At 220, 220, 240 now. ..at 240. We're looking for 260. -Thanks a lot. Thanks, auctioneer. -Thanks a lot, chief. Thanks very much. Charles's boldness pays off and the old hand wins the day. so he takes an early lead with £317.46. -I'm getting the idea now. -Don't tell me, it reminds you of Persia. How much are they for the pair? What's going in the boot? There's a fair weight in there. New expert Raj Bisram joins the road trip. This auctioneer from Kent is taking on Charles Hanson as they shop around Berkshire, Wiltshire and Somerset before heading to their first auction showdown in Winchcombe.